Blue Donkey Grant Park is now offering the famous Brazilian Cheese Breads. Made with a special combination of ingredients, Kazaero Cheese Breads come from a long tradition in Central Brazil. 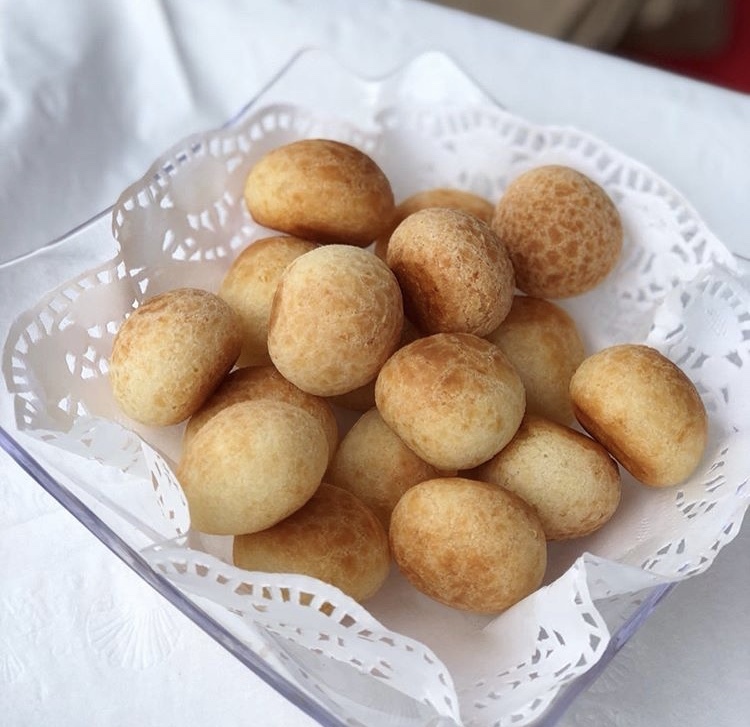 The Brazilian state of Minas Gerais, where much of Brazilian coffee comes from, is the original home of Cheese Breads. In Brazil, strong brewed coffee and cheese breads are common. In fact that makes a great combination any time of the day. Stop by Blue Donkey Coffee Grant Park for freshly baked Kazaeros and, as always, a great cup of coffee. Photo credit to Kazaero Company. Click here for more info. 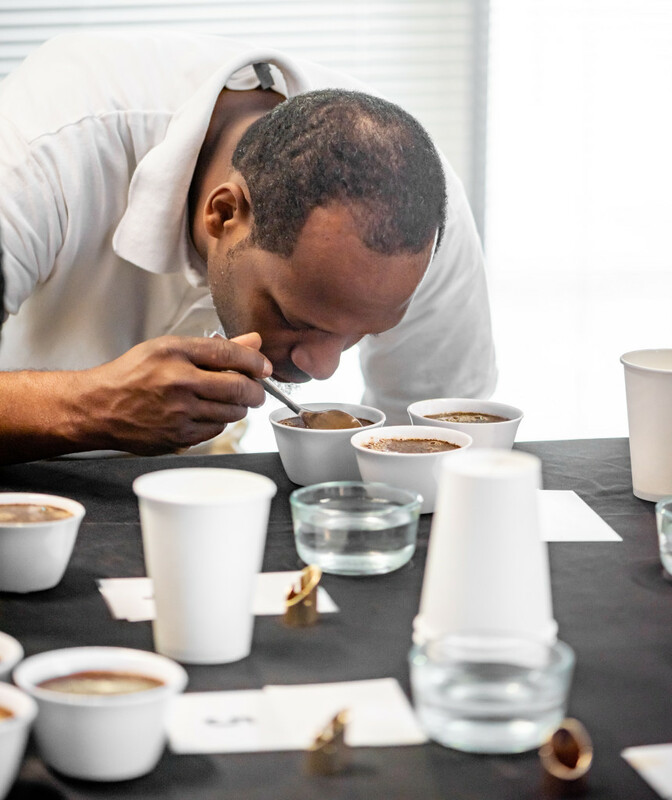 Blue Donkey Coffee sponsored a cupping event during the March 79, 2019 National Coffee Association yearly Convention. Six of our coffees, representing six different countries were featured and blind cupped. The objective was to highlight some broad attributes of each region. The coffees did not disappoint and here are some highlights. Our Natural Direct Trade Brazil Cerrado was noted for its complex profile and distinguishable cinnamon notes. The Cerrado is an important element of our program as it integrates some key blends. It is a great representative of the Cerrado region. It is complex as one would expect for a natural, sweet as one would expect for a good Brazil and free of any background edges. We featured several other great coffees and will describe them soon. Coffee washing stations in Kenya are community run and operated enterprises organized for the purpose of processing coffee beans post-harvest. They are typically located central to a vast group of coffee farmers who, at harvest, bring their freshly picked cherries to be “washed” and dried. Washing is the name given to the process of preparing the beans to be dried and later sorted. Recently the Blue Donkey team had the privilege of cupping a Kenya AA from the Kagumoini washing station. This is an outstanding coffee with limited availability. We sample roasted the Kagumoini at three different temperatures. At the lower temps the Kagumoini exhibits an array of tones from Herbal tea to sweet lemon and honey. At a bit higher temps, sweet lemon makes room for milk chocolate and herbal tea. This is available to purchase online as a 12oz or 2.2lb bag. Click here! In our first post we discussed how a pour over coffee was different from espresso and drip coffee. Today, we want to share with you the best way to make a V60 at home! Bring your water to a boil. For this recipe you will need about 375 grams of water, so bring a little bit more than that to about 204 degrees. Once your water is hot, place the filter into your V60 and pour enough hot water over the filter to wet and rinse it. This an important step in order to wash the paper taste from the filter. It also serves to warm up your coffee mug! Make sure and dump the rinse water once completed. Measure out 25 grams of coffee and grind to a coarse grind, similar to kosher salt. Place your coffee mug and V60 on your scale, add coffee, and then set scale to zero. One of the most important steps in making your cup of coffee, is to allow for the “bloom”. This step allows the coffee to release its excess gas. Wet just enough of the coffee to cover it with water and let it set for about thirty seconds. When you do this, you will notice the coffee expand and bubble as it releases the gases. Once this is complete slowly pour your water in a circular motion for the next three to three and a half minutes. Pausing briefly to allow the water to settle evenly. Pour the water till your scale read (x) grams of water. Once it’s finished, you are ready to drink your delicious cup of coffee! Did you know that coffee actually comes from a cherry? That’s right, the dark coffee bean that produces your morning drink, actually began it’s life as a red coffee cherry. Coffee is grown in a region known as the “bean belt”. Coffee is a very picky plant and likes specific kinds of weather to grow and flourish. It grows best in tropical regions around the middle of the planet and near the equator in countries such as Brazil, Ethiopia, Mexico Guatemala and more. It takes about three to four years for a coffee plant to mature and produce fruit that is ready to be turned into a coffee bean. However each tree only produces enough coffee cherries to for one to one and a half pounds of roasted cherries. One pound of green coffee equals about 12 ounces of roasted coffee. There are two types of coffee plans, Arabica and Robusta. The Arabica coffee plant is the most common type and about 80 percent of all coffee comes from the Arabica plant type with different varietals based on the location it is grown. South America accounts for about 45 percent of all coffee exports and most of this coffee comes from Brazil! In fact much of what Blue Donkey uses is from Brazil. Once the coffee cherry is ripe, it is hand picked by the farmers who look for the ripe cherries to gather. After the cherries are picked they must be processed quickly so that they won’t spoil. Coffee cherries can go through two different process to go from cherry to bean. Coffee is either wet or dry processed. Wet processed coffee is run through a machine that removes the pulp and skin from the coffee cherry leaving only the bean and parchment skin. Dry process is when the cherries are spread out in the sun to dry. Farmers must keep an eye on the cherries as this can take several weeks and the cherries must be raked and turned so that they dry as evenly as possible. Once the coffee bean is dry it goes through several more steps as it goes from cherry to the green bean that finally gets roasted! Have you ever had the chance to visit our location at Georgia Tech? Have you noticed the term “pour over” on the board and wondered what that was? Or maybe you’ve visited another shop or heard the words and not known what it meant. Well today Blue Donkey is here to help you! Coffee can be brewed in a variety of ways. The two varieties which most people are familiar with are what are referred to as “drip coffee” and “espresso”. Drip coffee is most commonly made at home in which the water is showered over the top of ground coffee beans with an automatic coffee brewer. Espresso is when those same beans are ground much, much finer and water is forced through the beans to create a highly concentrated coffee. For each of these methods, drip and espresso, a very different end result is produced. With pour over coffee, your result is similar to drip coffee. However with drip coffee you have very little control over what is known as the “variables”. With most automatic brewers you have a set temperature, a specific grind that works best for that one coffee maker and a set amount of water. With pour over methods you have a lot more control over all these variables which allows you to make the best cup of coffee for the bean you are using. Not all coffee produces the same flavor, and different methods of brewing can bring out different flavor profiles in the coffee you are drinking. One of the most common methods of pour-over, and the one Blue Donkey uses at our Georgia Tech shop, is known as V60. The V60 was created by a Japanese company named Hario and can be made of different materials such as plastic, glass, or metal. The most common V60 produces one to two cups of coffee at a time, however larger ones can produce more. The reason that a V60 is considered a pour over is because the water is “poured over” the top of the coffee grounds by a person using a kettle. The most commonly used kettle used when making a pourover of any kind, is referred to of a gooseneck kettle. This kettle allows the coffee brewer control of how much water is being poured over the coffee. Once you have your V60 and your kettle, all you have to do is figure out the best way to make your cup of coffee! Stay tuned for our favorite recipes and how to make a V60 a home! Other varieties of pour over and ones we will go more in depth with later are Chemex and Kalita Wave.